I bought the following things which I felt would be required in case of emergencies. Tyre Inflator: I bought the Reqtech inflator via Amazon which was well reviewed in Team-BHP. At Rs. 999, I felt it was a good balance between reliability and being cost effective. Tyre Puncture kit: I bought one from motocop a few months ago via SnapDeal and it has been unused. I threw it into the car for emergencies. 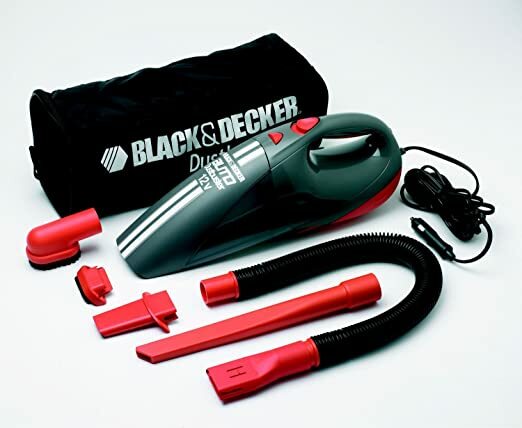 Car vacuum cleaner: I’d bought one online via SnapDe al (Black and Decker ACV1205) a few months ago and never used it. Threw it into the boot too to clean up all the messy crumbs my sone would leave inside the car. I hate eating in the car, but a long trip meant some amount of snacking would be done. The last 3 were through a website called jazzmyride. Therewas some problem in shipping the items. I almost gave up on them but they reached half an hour before we left! The website support team had pushed the courier to deliver it on time.The jumpstart cable looked ok and the tow rope felt strong. The emergency beacon/torch was very flimsy. I got a boot organiser to put all the stuff in, threw in some new micro fibre towels and some glass cleaner. My sons car seat was washed and reattached. I’d purchased Philips Extremevision headlamps but didn’t have the time to fix them. I carried them with me in case a lamp fused on the way. I debated seat covers, but gave up as there were very few options available in Vellore. We filled up petrol and got the car cleaned on the morning of our planned trip. Looks like we are definitely good to go!